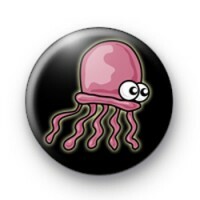 Cute octopus badge in black with a lovely kids illustration of a cute octopus in purple. A very cartoon inspired badge, this is ideal for younger kids and teachers. If your children are learning about the environment and the ocean they may enjoy our selection of fish badges, starfish badges and seaside themed badges. We have loads to choose from and they are always popular with schools. These badges are 25mm (1 inch) button badges and as always are made by hand in our family workshop. We deliver our badges all over the world and larger orders qualify for free delivery. We also offer a next day delivery option to certain locations if you have left it a little late to order.